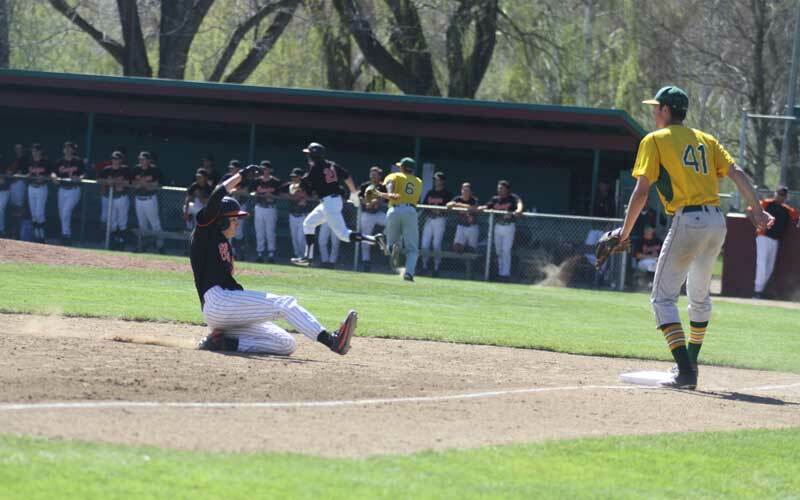 Tables have turned for the Lassen Community College baseball team; previously on-track for playoffs, the Cougar team recently ended their season with five straight losses. The Cougars took on Feather River College for a doubleheader Friday, April 20, returned home for a third game against Feather River Saturday, April 21 and ended their season with a doubleheader at College of the Redwoods Wednesday, April 25. Prior to taking on the Feather River Golden Eagles, the Cougars had a firm grip on a four-game winning streak. Unfortunately, the streak promptly ended at the feet of Feather River. Lassen lost all three games against the Golden Eagles with scores of 12-4, 7-0 and 7-6, respectively. Lassen then moved on to the College of the Redwoods to take on the Corsairs. The Cougars lost both games of the Wednesday doubleheader with scores of 15-0 and 5-4, respectively. During the first game against Feather River, the Cougars and the Golden Eagles were fairly well matched with Lassen taking three runs and Feather River doing the same, all in the first inning. Cougar runs in the first inning were made by Ryan Thomasy, Robert Lujan and Eric Carlson. Thomasy initially doubled and advanced to third from a sacrifice hit by Aiden Leahy. He then scored on Carlson’s single. Lujan followed Carlson with a single, and an error by the Feather River short stop sent Lujan to second and Carlson to third. Then, a single from Jordan Taylor earned the second and third runs for the Cougars. Inning two saw the final run from the Cougars to total their tally at four, but it also brought in two runs for the Golden Eagles to initiate their lead. Sami Baig scored the Cougar run with a walk putting him on first, a single from Leahy advancing him to third and a single from Lujan bringing him in. On the mound for the first game against the Golden Eagles was Connor Fleharty, Taylor and Michael Sallee. Fleharty pitched for 3.2 inning with 23 batters faced. He struck out one and gave up seven hits, 10 runs and four walks. Taylor pitched for three innings. Of the 15 batters faced, Taylor struck out four. He gave up three hits, two runs and two walks. Sallee pitched for 1.1 innings, faced eight batters sand gave up one walk in total. Game two at Feather River didn’t see any runs from Lassen as the final score was a shutout Golden Eagle win of 7-0. Lassen did have a total of seven hits, including a double from Luke Smith. Pitching for Lassen in the second game against Feather River was Tony Goodman and Coldin Shopp. Goodman pitched 4.1 innings, faced 23 batters and struck out one. He gave up eight hits, seven runs and three walks. Shopp pitched for 3.2 innings, faced 14 batters and gave up three hits and one walk. After a tough day on the Feather River field, Lassen returned home and brought the Golden Eagles with them for the third game in the series on Saturday. Though the Cougars gave a much better performance against the Golden Eagles at home, the game still went to Feather River with a score of 7-6. Lassen initially captured the lead with three runs in the bottom of the first inning and none to show for Feather River. Leahy was first to reach first base with a walk, and with a double from Carlson, he managed to advance to third. Lujan then walked to load the bases, and a wild pitch sent the three Cougars on base forward, thus brining Leahy in. Lincoln Turner then brought in both Carlson and Lujan with a double before the inning was called. The second inning brought in a fourth run for Lassen and again proved fruitless for Feather River. An error by the Feather River shortstop allowed Thomasy to reach first. He then stole second and advanced to third thanks to a throwing error by the Golden Eagle catcher. Then, Leahy hit a sacrifice fly to bring Thomasy in and set the score at 4-0 to start the third inning. Inning three saw the Golden Eagles get into the game with to runs on the board, but the lead still belonged to the Cougars. Inning four saw a run from both sides of the board to bring the score to 5-3, Lassen. Lassen’s run was scored by Baig after he hit a double, advanced to third off of a sacrifice hit by Jordan Dicus and finally reached home based on an error by the second baseman while Thomasy was at bat. The Golden Eagles began to close in during the fifth inning with another run scored to bring their tally to four, but a run scored by the Cougars during the bottom the sixth put Lassen back to a comfortable position. During the sixth inning, Dicus singled to start things off in favor of the orange and black. Thomasy then grounded out to third base in sacrifice to allow Dicus to advance to second, and finally Carlson singled to bring Dicus home. However, the Feather River Golden Eagles weren’t quite finished on the field. In the seventh, eighth and ninth inning, Feather River scored a run to not only catch up to the Cougars, but also surpass them and steal the lead with a final score of 7-6 on the board. Pitching for the Cougars during the final game against Feather River was Jared Kiessling, Jack Bell and Mitchell Menns. Kiessling pitched for 5.1 innings with 26 batters faced. He struck out two and gave up eight hits, four runs and three walks. Bell was on the mound for 2.1 innings. Of 13 batters faced, he struck out two. He gave up one hit, two runs and four walks. Menns pitched for 1.1 innings with six batters faced. He gave up one solo homerun with no additional hits or runs scored. With the Golden Eagles over and done with, the Cougars believed they were ready to take on the College of the Redwoods Corsairs on the road on Wednesday. Unfortunately, the home field advantage does exist and the Corsiars utilized every ounce of home pride. Lassen lost the first game by a score of 15-0. The three Cougar pitchers for the first Redwoods game were Shopp, Fleharty and Carter Glick. Shopp pitched for one inning, in which he faced 10 batters. He gave up four hits, five runs and three walks. Fleharty was on the mound for four full innings with 25 batters faced. He struck out one and gave up 11 hits, 10 runs and three walks. Glick finished things off with one inning on the mound. He faced five batters and struck out two. He gave up two walks. During the final game of the season, the Cougars gave it their all and stayed in the fight well into overtime. Lassen College finished off their season with a 10-inning game against the Corsairs that resulted in a 5-4 score favoring Redwoods. Lassen started strong with one run in the first inning. The Cougar run was courtesy of Thomasy, who had initially singled and advanced to second on an error. He then advanced to third while the Corsairs were occupied with a double play that got both Carlson and Leahy out, and with a single from Lujan, Thomasy finally managed to make it in. The Cougars then followed up with a run in inning three, and a third in inning four. In the third inning, Leahy singled, advanced to second on Carlson’s single and sprinted home on Lujan’s single. During the fourth inning, Kiessling singled, advanced to third on Tiler Whiteaker’s single and scored on Menns’ hit. Redwoods tied things up during the bottom of the fourth with three runs scored all at once, and the 3-3 tie stayed as such until the end of the eighth inning. Inning eight saw another Lassen run to steal the lead once more, but a run from Redwoods in the bottom of the ninth forced the Cougars to engage in overtime. During the eighth inning, Leahy walked, advanced to second on a wild pitch, reached third on Carlson’s hit and finally sprinted home thanks to an error by the Corsair shortstop. The 10th inning proved fatal for the Cougars, unfortunately, as the Corsairs managed one more run to steal the lead and thus the win. With a final conference record of 12-13 and overall record of 18-22, the Cougars called it good and turned in their uniforms. 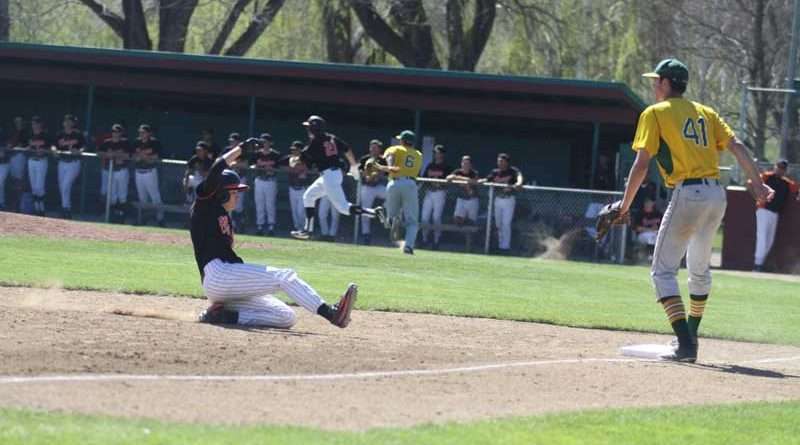 Though they didn’t end on the best note, orange and black fans know the Cougars gave it their all on the diamond every week; thus, Lassen County remains proud of the Lassen Community College baseball team for the 2018 season.